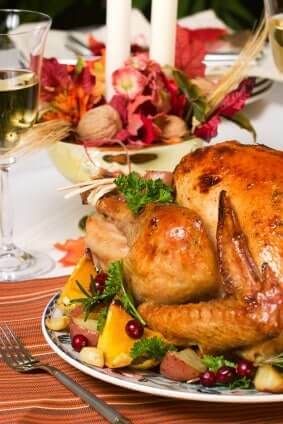 Thanksgiving with food allergies can be a challenge, after all, food is the focal point of Thanksgiving and it is probably safe to say that it always will be. Don’t let a holiday centered around food scare you. Even though a traditional Thanksgiving meal is full of common food allergens, you might be surprised to know that it doesn’t have to be. With a few substitutions you can have a feast free of the top 8 allergens. The first Thanksgiving that we were eating with food allergies, I altered our traditional Thanksgiving recipes using substitutions for our allergens. If those options don’t work for you, hummus might be another option. Those with a sesame allergy can try this sesame free hummus recipe from Allrecipes.com. Some might say that there is no room on a crowded Thanksgiving dinner plate for a green salad but I beg to differ. Not only are salads healthful, they also introduce different textures to your palate and color to your plate. Go to the recipe for Green Salad and Cranberry Vinaigrette. Turkey day wouldn’t be the same without it but a few precautions must be made to ensure that the centerpiece of your meal is “safe”. This is mostly true if you are allergic to wheat because turkey can have broth added to it which often contains wheat starch. Luckily, it isn’t difficult to find a gluten free turkey at your regular grocery store. Just be sure to read the label carefully and, if the label isn’t clear, call the company directly to confirm that the turkey is gluten free. Also, if you have a wheat allergy, throw out the gravy packet that is often included with the turkey because it most likely contains wheat. Read on to find out how you can make a delicious, “allergy-free” gravy from scratch. Finally, there are a number of ways to prepare your turkey. We like this Fresh-Herb Turkey recipe from Cooking Light Magazinee. The cranberry sauce probably isn’t the most challenging component of an “allergy-free” turkey dinner but, since we’re on the subject, I wanted to share my favorite recipe. This isn’t your ordinary cranberry sauce out of a can, it is a delicious relish that tastes great alongside turkey or spread on your sandwich of turkey day leftovers. Cranberry Apple Relish from Cooking Light Magazine. Traditional mashed potatoes contain heavy cream and butter which makes them light, fluffy and rich all at the same time. While that combination can be difficult to duplicate without using dairy products, these “allergy free” mashed potatoes definitely fit the bill. Go to the recipe for “Allergy Free” Mashed Potatoes. Since wheat free bread is difficult to make as good as the real thing you might think that wheat free stuffing would be just as challenging. Luckily, wheat free bread can be a part of a delicious stuffing that tastes as good as any (wheat-filled) boxed variety that you can find. Go to the recipe for Wheat Free Stuffing. Dessert is the perfect ending of any great meal (and happens to be my favorite course). It can also pose the greatest challenge to those of us who are eating with food allergies. So many favorite and traditional desserts contain common food allergens. Luckily, there are many “allergy free” dessert options including those that don’t require baking from scratch. You’ll find many baking mixes to choose from at the store. Cupcakes decorated with the Thanksgiving theme, sugar cookies in the shape of turkeys, and pies made with “allergy-free” pie crust mixes are all easy options. If you’re having a dessert that begs for whipped cream on top but you can’t have dairy, look for Rich Whip in the freezer aisle (near the Cool Whip) at your grocery store. It comes frozen and, when thawed, can be whipped to the same consistency as whipped cream. While this product is free of most of the top 8 allergens, it does contain soy lecithin which can be a no-no for those with soy allergies. If you react to soy lecithin, this is not an option for you. *Update 11/2012: Rich Whip comes in three varieties including a ready-to-whip carton and pre-whipped bowl topping, original and light. The ready-to-whip variety is dairy free but the pre-whipped is not. You can read the ingredient list here. I certainly don’t endorse this product as health food but it is a nice substitute for whipped topping for these special occasions. For an easy and delicious dessert that is a perfect Thanksgiving dinner ending, check out this recipe for Pumpkin Bars. So, that is a traditional Thanksgiving meal in our house. Yours may differ a little (or a lot) but hopefully this menu helps you plan your traditional meal, too.